Longboard skateboards differ from regular skateboards in length shape and style. Longboard riding is about cruising and speed. They are big and stable on the ground and at high speed. The Longboard Skateboard culture is very different than regular skateboarding. Influenced by surf style it is more relaxed and mellow. Not really trick based but more about flow. Longboarders carve and cruise in the streets. The feel of a longboard is a lot different too. The larger and softer wheels roll easily over rough ground. The longer deck is more stable and easy to control. The nose and tails are shaped to allow deep turns and carves without getting wheelbite. This all allows you to go fast even on rough surfaces. Rolling down a rough street on a longboard can be fun. Rolling that same street on a smaller normal skateboard would be bone rattling. I often walk certain parts of the city when on my short skateboard. Its just too rough. But a longboard would just cruise right through. You can often find devoted Longboarders on mountain roads and long slopes going at speeds even cars wouldn’t travel at. Downhill, speed and racing is what a lot of longboarders do. They get suited up in gloves and sometimes full body leathers to protect them from the ground. They get low to the ground and carve and slide on their hands, with the special gloves of course. Just like all skateboards they have no brakes. Other than rolling out on flat, dragging their feet or sliding along the ground They can't stop very well. This has caused some trouble with the law in some places. Some cities have banned the use of longboards on certain roads due to the speeds and danger. They are a culture of their own. Longboarders have a different attitude than regular skaters. They tend to be mellower. More females participate in the activity too. The style is low to the ground. With hands often touching and dragging on the ground. Downhill speed and racing is what its about. Slalom and other distance events are that types of competitions that longboarders have. Or they just go and bomb hills as a group. What fun! So, what makes it a Longboard? The physical difference between a skateboard and a longboard skateboard is the length of the deck, width and size of wheels and trucks. Any deck longer than 32” usually with big wheels and wide trucks is a longboard to me. There are other more specialized types too. Pintail decks have a stubby pointed nose and a narrow pointed tail these boards allow the trucks to turn without wheelbite. This allows for really deep turns and carves. 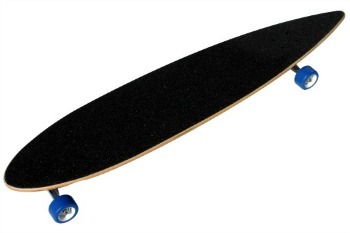 Hybrid or Basic Longboard. I like the hybrid kind that has a point nose and narrow tail but still has a kick on the back just in case I want to pop an ollie on it. It would be a long and slow ollie at that. Drop through and Drop Decks have the truck mounted through the deck. They are often shaped so that the deck is lower than the truck. Keeping you right down at the ground allows for a very stable board at high speeds. The Way You Ride Counts! What I like about longboard skateboards is that you can carve and pump for speed on flat ground. They feel good just to roll on. They go at steady fast pace, they just cruise. The simplicity of that really attracts me to it.